Considering an electric radiant heated floor system for your home? Let Warmzone be your “go to” for solid solutions to your heating needs. Warmzone offers a wide variety of heating systems that are flexible enough to be installed under just about any type of surface. ComfortTile cable is less than ¼ of an inch in thickness and is installed in thinset so there is no floor buildup. With a durable, stainless steel braid covering, the cable is perfect right off the spool for custom shaped flooring projects involving tile, marble and slate surfaces, among others. The cable also comes pre-configured in mats that are low-profile for ease of installation. HeatShield floor heating insulation panels are perfect for laminate or wood flooring applications. The ½-inch thick panels feature polstyrene insulation that is covered with a thin, specially profiled aluminum. Their construction creates excellent downward insulation and optimizes upward heat distribution for reduced energy consumption. Installation is simple. Just lay panels on the existing floor, press cable into grooves provided and place wooden laminate floor on top. Warmzone FloorHeat is a low-voltage, self-regulating heating element that operates efficiently and enjoys a long life by design. Like HeatShield panels, this heating element is thin, requires no floor buildup and can be easily secured to the subfloor with adhesive, staples or pegs. Panels can be cut to length on site and installed under most floor coverings, including tile, stone, resilient, laminate, hardwood and carpet, making for easy installation under a variety of surfaces. And for those concerned about the invasive nature of radiant floor heat, there’s RetroHeat radiant heat elements that can be retrofitted to existing floors with minimal effort between floor joists to efficiently heat your floors. Heat panels are available for joists with 12, 16 and 24-inch spacing and can be cut on site, so they’re easy to work with for a contractor or do-it-yourselfer. With so many choices there’s bound to be a solution from Warmzone to fit your budget and project requirements. Give them a call today to find out how Warmzone can help you find the perfect radiant heated flooring solution for you at 888.488.9276. Warmzone offers several high quality heated driveway and radiant snow melting systems available for both commercial and residential applications. Among their most popular products you’ll find ClearZone cable, a trusted, popular snow and ice melting solution among homeowners and professional builders alike, and a great solution for snow removal during the cold winter months. ClearZone electric snowmelt cable is incredibly energy efficient, fully automated, maintenance free and easy to install. Plus, it’s readily customizable to meet the needs of just about any project, including retrofitting existing driveways. That’s because ClearZone snow heat cable can be purchased on the spool in a form that’s durable, versatile and easily configured for use in a variety of applications. This trusted, popular snow melting solution allows for greater flexibility so it’s good for custom layouts, or for use in large snow melting jobs and unconventionally shaped areas. If you’re a do-it-yourselfer or contractor with limited experience in radiant heat installation, it may be more beneficial to choose ClearZone Radiant Snow Melting Mats. They’re basically ClearZone heat cable pre-spaced in mats to create a convenient, versatile design. The heat cable is pre-spaced and attached to a durable backing for proper cable spacing and easy “roll-out” installation. The backing can be cut on site so mats can be installed around corners and odd layouts. ClearZone cable is also designed for installation under a variety of applications, from new concrete pours to paver stones. Whether pre-configured or right off the spool, it can easily withstand the hot temperatures of new asphalt construction jobs and installation is easy. Asphalt is spread directly over the rugged ClearZone heat cable and then compacted. 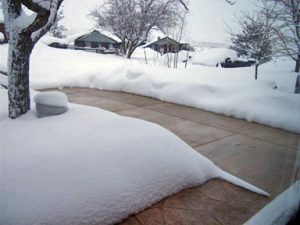 Embedded, fully automated ClearZone radiant heat snow melting provides a discreet, reliable snowmelt solution for your driveway or sidewalks. For heated stone or brick paver driveways and sidewalks, the cable is laid out in the bedding material of the driveway or sidewalk to be heated before a bed of sand is applied. The pavers can then be directly placed over the new heat cable. If you’re current plans don’t involve a new driveway, Warmzone has the expertise to retrofit a system for you inexpensively. ClearZone radiant heat cable can be easily laid over existing asphalt and secured using clips and nails, followed by a few shovels of new asphalt. The good news–the cable only requires a ½ inch of asphalt, a minimal amount (when you consider the cost of an entirely new driveway) to operate properly and provide quick, efficient, effective snow removal. 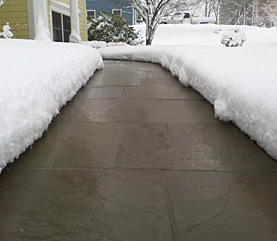 A ClearZone snow melting system can also be installed in existing driveways using saw-cut technology. Grooves are cut into the existing concrete or asphalt to allow for a proper retrofit. The cable is laid into the grooves and then sealed with an epoxy topcoat (for asphalt, an additional layer of asphalt is added). To learn more about ClearZone snow melting cable, contact Warmzone at 888.488.9276 or go to www.warmzone.com. Say goodbye to your snow shovel. Forget about that expensive snow removal service. 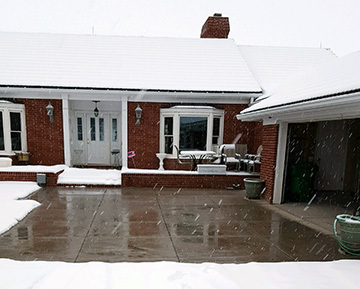 A ClearZone heated driveway is a great way to stay ahead of inclement weather. 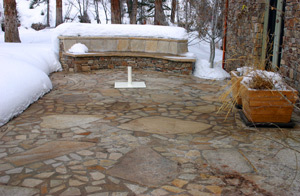 With a radiant heated snow melting system, you’ll never have to worry about timing. Energy-efficient ClearZone systems are fully automated, maintenance free, easy to install and can be customized to meet the needs of just about any driveway or budget. 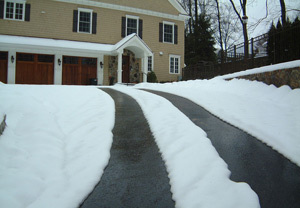 Electric heated driveways use a high-tech snow sensor that signals the system’s controller to activate the radiant snow melting system when it detects precipitation and temperatures are below a set point (usually 39 degrees Fahrenheit). System response times are fast. Once activated, the electric heating cables generate instant heat to prevent snow and ice accumulation before it happens, keeping driveways and walkways clear and dry. 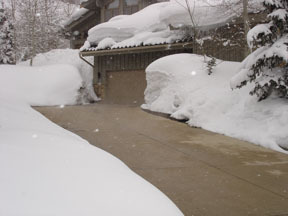 Imagine waking up the morning after a snow storm to a clear, dry walkway and driveway. 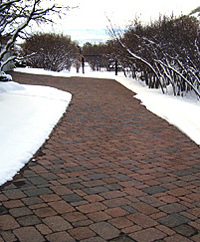 With an automated radiant heated driveway, it’s possible to see pavement all winter long, regardless of the conditions! 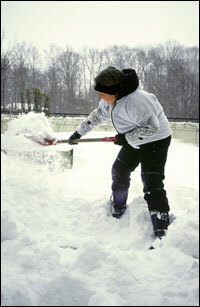 ClearZone’s super snow-clearing power renders the task of planning for snow removal obsolete. While there is a cost for the initial installation, it’s relatively insignificant when you compare it to the dollars you’ll save when you permanently dismiss your snow removal service. There are no contracts to sign, no flat fees, no wasted dollars and low returns during mild winters. Fully-automated electric radiant heat systems activate only when the conditions for snow are present, so you only pay for the resources (electricity) you need, when you need them. No more waiting for your service to show up, or stooping to shovel snow. Best of all, you don’t need to build a new home to enjoy the convenience of radiant heat during the winter months. ClearZone radiant heat solutions are fully customizable to fit your requirements, and your budget. Some customers choose to install ClearZone radiant heating cable under the entire paved surfaces of their sidewalks and driveways to keep them free and clear from snow. 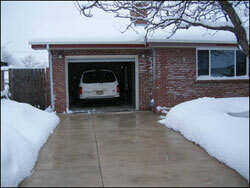 Others choose to heat tire tracks or an 8-foot strip in the center of their driveway. ClearZone systems are also commonly installed in sidewalks, patios and steps, and other well-traveled areas around the outside of homes and businesses. The cable works equally well in new concrete pours, asphalt, pea gravel and stone pavers, and can even be retrofitted to your existing driveway and walkways, without compromising performance. 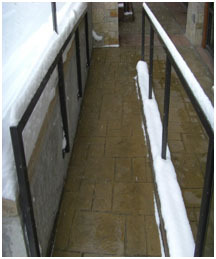 Warmzone snow melting systems include installation support and complete system design/layout services. Free installation training courses are also offered by Warmzone. Installers can complete courses on site at Warmzone’s corporate office or online. 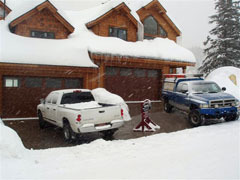 When it comes to snow removal, you really can’t go wrong with ClearZone snow melting systems. Using top-of-the-line components and manufacturer warranties and backed by industry leading system design and customer service, Warmzone snow melting systems are the clear favorite for homeowners and builders alike. ComfortTile floor heating systems are perfect for cold, drafty rooms or exposed wood and tile floors that can make bare feet uncomfortable and leave rooms feeling chilly. This winter you can say goodbye to slippers and worn out socks with radiant heated floors. Either as a supplement or an alternative to forced air systems, ComfortTile floor heating systems deliver greater efficiency and more comfort for you and your family. Comfort is central to the ComfortTile name, and for good reason. These radiant under floor heating systems consist of heating cables securely fitted under the surface of your floor to provide safe, evenly distributed heat. Unlike traditional forced air systems, there are no air ducts, so there’s no heat loss or cold drafts to contend with. Once the ComfortTile system is activated, it radiates warmth through objects within rooms to deliver consistent, even heat. What makes ComfortTile an ideal choice for warming your home? The technology is cleaner by nature. Forced air systems require regular maintenance, including filters and duct cleanings to maintain your home’s air quality. Radiant heat does not impact air quality, and it is also energy efficient. That’s because Warmzone ComfortTile thermostats are specifically designed to control electric radiant floor heating systems for maximum comfort while minimizing power consumption. The amount and frequency of heat can be controlled by room, or by zone. For example, if you arrive home at 5:00 p.m., the thermostat can be programmed to turn on your foyer and kitchen floors at 4:30. You can program your floors to warm according to your schedule. 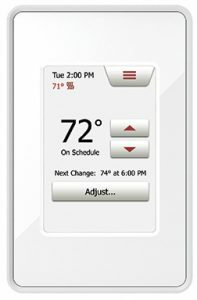 This convenient zone heating allows you to dial down the thermostat on your furnace, saving you money on your monthly gas bill, as well as the energy you need to power your heated floors, keeping you comfortable and warm. At the heart of the radiant heat magic are ComfortTile heat cables. Extremely durable and flexible ComfortTile cable is made with premium materials to withstand the harshest conditions, while delivering fast response times and outstanding performance. The cable is available in two fully customizable forms—on the spool or in pre-spaced adhesive-backed fiberglass mats. CT mats are pre-terminated for use with 120 and 240 volts and heat an area two feet wide. They are available in a variety of lengths. 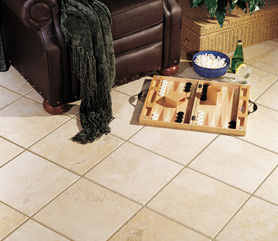 ComfortTile safely and efficiently warms tile, laminate, wood, and stone floors. Both applications are equally easy to install, but for custom shaped floor heating projects, the spool rules. ComfortTile cables come with a GFCI protected thermostat and strapping to secure and properly space the heating cable for confident installation. And all sizes and adjustments to cable spacing and coverage can easily be made as you go, giving you the creative freedom to heat tight corners or uniquely-shaped areas with ease. It’s not too late to enjoy warm floors this holiday season. 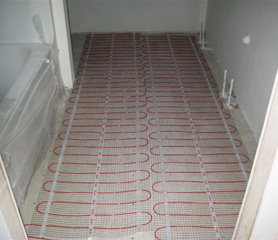 To find out more about ComfortTile floor heating systems, please call 888.488.9276, or visit www.warmzone.com. In 2016, Newark City, New Jersey broke the record for receiving the most snow from one multi-day snowstorm. As of January 24, the Weather Service lists Newark’s snowfall total at 28.1 inches, breaking all records set since 1931. As city snowplows struggled to keep the main thoroughfares open, homeowners struggled to keep in compliance with local snow removal laws by shoveling and salting sidewalks and driveways. According to the Newark Municipal Code, owners, tenants, or occupants of homes in the city must remove snow and ice from sidewalks adjacent to residential properties after snow ceases to fall or ice ceases to form. The code requires that a path three feet in width be cleared on sidewalks in front of homes. If ice cannot be removed from sidewalks, the code requires that sand or other substances be spread on the ice to make the surface safe for pedestrians. Given the property owners’ responsibility for keeping sidewalks clear of snow and ice, Newark residents have been busy these past few winters. And weather experts continue to predict above average snowfall for upcoming winters. But Newark residents have options when it comes to preparing for the next snow season. In addition to having a few extra supplies on hand and a full refrigerator and cupboards, some New Jersey residents are turning to radiant heat to make the snow removal process a bit easier. 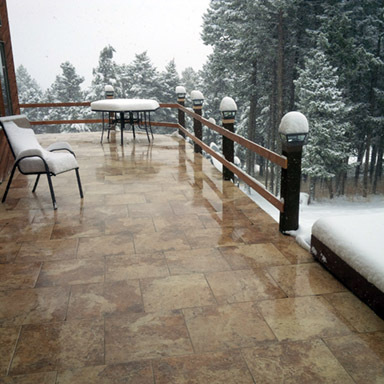 The proven ClearZone electric snow melting system is commonly installed in both commercial and residential applications. From large heated driveways and parking areas to custom sized walkways, ramps and loading docks, ClearZone systems are versatile and can be easily customized. 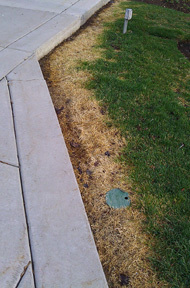 When you purchase a Warmzone snow melting system, you also receive free installation support services. We have an experienced staff dedicated especially for installation support if you need. Should your installer have any questions during the installation, he/she can speak with one of our installation experts to resolve any issues. Free installation training is also available. When it comes to customer service, you’ll find that Warmzone is second to none.